A self-published Author. Book and product reviewer. Charity Streamer. Tea addict. Geeky Nerd. Photographer. Professional Klutz. 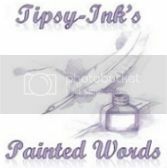 I'm a NA/YA Urban Fantasy writer named Tiffany, who created the brand Tipsy-Ink from a high school nickname. The nickname 'Tipsy' came about when my friends realized how clumsy I really was. My inability to casually walk in a straight line has been the topic of discussion many times, another popular topic is my ability to trip over nothing in particular and while climbing stairs. I also stub my toes regularly. I included ink as a play on inc (incorporated) and it just stuck. I have a tendency to randomly become passionate about one cause or another. Because of that I have taken up streaming and fundraising for different charities. I've been told I'm loud, which is not only mandatory but expected in my large Hispanic family. But one conversations with new people always make me all sorts of nervous. I've been reading and writing since childhood. I started with reading to distract me from a rather unpleasant time in my childhood and slowly after many exaggerated stories from my family I started penning my own poetry. It wasn't till my late teens when I started writing stories. I couldn't decide what I wanted to be so I chose one of the only careers that would let me do everything. Here you'll find whatever ridiculous thing that has piqued my fancy, whether it be a book or Author I'm obsessed with or a song I just can't get out of my head. You'll also get updates on my Book Releases. You'll also get a few sneak peaks into my current WIP, including some excerpts and teasers! I am currently only writing under my real name but I do plan on expanding to other genres with a pen name. Surprise, Surprise... its another nickname. It's free and completely spam-less . The Newsletter is located on the page title Mailing List , which also contains all the newsletter need to knows.